Army Rings custom made for active soldiers and retired veterans. All rings are available in Silver and Gold and come in several styles and designs. Some prefer a signet design and others want a more formal look like a traditional class ring. There is also a design with heavy cast sides and an option to engrave on top. But no matter what style you choose, all military rings can be personalized to the individual’s taste. There are hundreds of emblems that can be placed on the sides of Army rings. Popular designs are the American Flag and the U.S. Army Eagle. Emblems for deployments are available for all current campaigns. Operation Iraqi Freed am and Enduring Freedom are most desirable and can be dated. Consider the Army crest or an insignia for a specialized unit. The deployment emblems of the last decade are very popular. The inside of the ring may be engraved with an enlistment date, the soldier’s initials, or even a word that has a special meaning to the recipient. 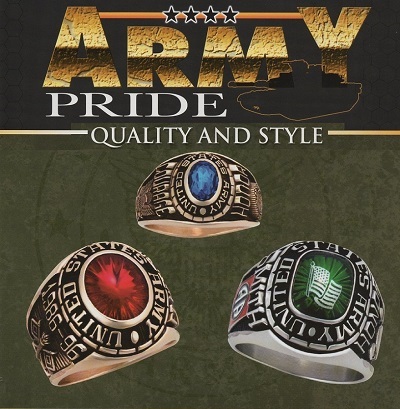 You can order Army rings online and have them shipped to your soldier’s home address or his military unit address. Shipping to military addresses can take a little longer and can’t be tracked. It takes a couple of weeks to complete the ring and each is crafted from high quality metals, such as gold, silver, or celestrium. The craftsmanship is unmatched, guaranteeing your satisfaction, as well as the recipient’s. Enclosed in a stylish gift pouch, there is simply no better way to show your gratitude and pride in what your soldier does to keep America safe and free. Army rings have been a tradition for almost 150 years for members of the Armed Forces. There is no other gift that will truly capture what it means to be part of the United States Army. Creating this memento of an Army career can be difficult, as there are so many choices in materials, styles, and engravings. However, once complete, you can be sure you have made the right choice for your friend or family member. Place your order today and show your appreciation for your soldier’s sacrifice and service with one of these beautiful custom military rings. This item portrays, loyalty and pride in one of the greatest armies on the planet. These rings are custom made using details provided when ordering. The company we use to create these rings process approximately 500 rings per week for the various military branches. We ask you to please allow 4-5 weeks for delivery. So order now today and avoid any delays ! I have received the order mentioned above and I am very happy with the product. It was a military retirement gift for my husband and he loves it.